Get The Rewrite cheaply from Amazon. You too can earn money from writing articles by signing up for InfoBarrel. 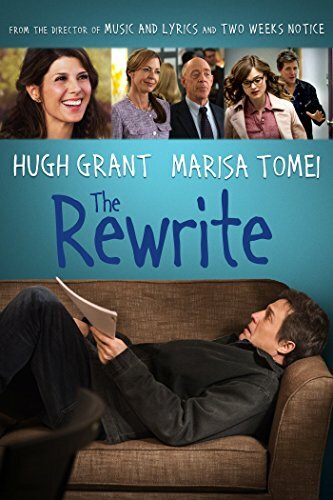 The Rewrite starts in Hollywood where screenwriter Keith Michaels (Hugh Grant, The Man From U.N.C.L.E.) is trying to get a job, any job, writing a new screenplay. Fifteen years prior he won an Oscar for Best Original Screenplay for his film Paradise Misplaced; since then he has had very little success at all, and has since divorced. His agent says that she has a job for him - as the writer in residence in for the screenwriting course at Binghampton University in upstate New York, as the existing writer has died. Michaels initially declines but, after his power is cut off during declining the job, he takes it, as it comes with both a house and a car. Michaels has no real interest in teaching the class, as he believes writing cannot be taught, and really doesn't intend to do any work at all if possible. One of his first moves involves sleeping with a soon-to-be student of his, Karen (Bella Heathcote, Dark Shadows, Pride and Prejudice and Zombies), something that is rather frowned upon. Admittedly, when he started the relationship, she wasn't actually a student, but he should have known better, and this causes him problems later on. Credit: http://en.wikipedia.org/wiki/The_Rewrite#mediaviewer/File:The_Rewrite.jpgMichaels's department head, Dr. Lerner (J.K. Simmons), gives him a whole pile of 30 page screenplays to read in a couple of days in order to select the ten students that he wants in his class. Not intending to do much work, his selection criteria are much simpler and based on the pictures of the students. He picks eight attractive young women and two not-so-attractive male students to fill out his class. An older student and single mother, Holly (Marisa Tomei), gave Michaels a screenplay late - which he also didn't bother to read - in the hopes that he would pick her too. Initially, he didn't, but she managed to talk him round. Keith Michaels doesn't know how to teach, doesn't really want to teach and made an enemy of a fellow faculty member and Jane Austen devotee, Professor Weldon (Allison Janney), on the first meeting at a cheese and wine evening where he had a bit too much wine and not enough cheese. This film does exactly what you'd expect it to do; there are no real surprises in the plot. Along the way, Michaels gets to enjoy teaching and starts to believe that it is possible to teach people how to write. His relationship with Holly, despite her being more his age than that of the young women he picked for the class, develops in the way you'd expect, with their being a mutual attraction there. Michaels gets inspiration from teaching, helps his students and becomes genuinely interested in them. The Rewrite was trailed that it is written and directed by the same man who wrote and directed Music and Lyrics, which also starred Hugh Grant. It looked, form the trailer, like the plot might be suspiciously similar to that one, as in Music and Lyrics Hugh Grant was a former pop star who gets new inspiration and a romantic interest and it looked suspiciously as if Hugh Grant might be a former screenwriter who gets new inspiration and a romantic interest. That part may well be similar but this film isn't, fortunately, a simple "rewrite" of that one. As a trivia point, the acceptance video that Michaels watches on YouTube that he gave for his Oscar win has clips from a younger Hugh Grant's actual acceptance speech for the Golden Globe he received in 1995 for Four Weddings and a Funeral. The Rewrite is a romantic comedy that does exactly what it says on the tin; don't expect anything new or original, but it's a decent enough light hearted bit of fluff.